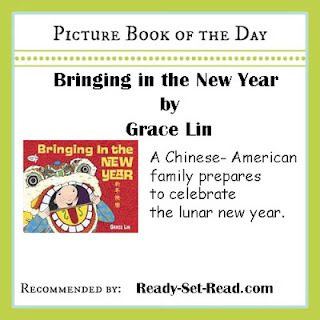 Bringing in the New Year by Grace Lin is one of my favorite choices for preschool children who are learning about Chinese New Year. The story follows one young girl's family as they get ready for Chinese New Year. Each page contains a clear picture and a simple sentence.The book would also work for children up to early elementary grades. Older children might like to explore concepts from the book in depth. This book would be a good jumping off point for learning chinese traditions about spring happiness poems, dumplings, qi pao dresses, lions, lanterns, and dragons. There is an informational authors note at the end of the book to assist with research. I love the simple texts and very clear illustrations that help young children learn about holidays in other cultures. This year Chinese New Year will be celebrated on Sunday, February 10. 2013 is the year of the snake. 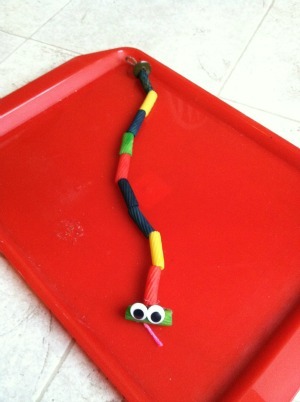 After reading the book we made a snake to celebrate 2013. I prepared this craft by dying pasta noodles in different colors. You can dye pasta by adding about 1/4 cup of rubbing alcohol and 1/2 package of pasta to a large ziploc bag. Add drops of food coloring until the color looks good. Shake around and rub the color into the pasta. Let sit until the desired color appears. Dump the alcohol and let dry. We tied one piece of pasta so it was perpendicular with the string. This will keep the other pastas from falling off and will also make a nice face for the snake. The boys added pasta. 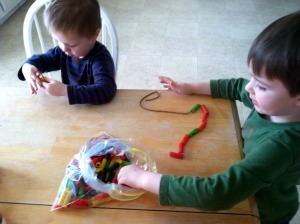 Logan made a pattern with his and Tyson just strung his on the yarn. We added some large buttons at the end to keep the pasta from sliding off and we also added other buttons to make a "rattle". You can draw a face or use google eyes. You can also glue on a tongue. You might also like our Chinese New Year dragon poem and puppet from last year. I am sharing this book over on facebook today as well. I've teamed up with a group of fantastic bloggers to bring readers a recommended picture book every day. You can find them on my facebook page each day. I'm super excited to get to check out a ton of great kid lit as recommended by other mom bloggers! If you aren't following on facebook, I'd love to have you there. Stop by and say hello my Ready-Set-Read page. Jackie I love your new look! (Is it new? Sometimes I read in google reader so this may be old news!) Anyway, super cute! Your new look is fantastic!!! I also love this post. Pinning it. What a great post! I'll share with my son's 2nd grade teachers because they do a China unit! Thank you! Your noodle snake is adorable! 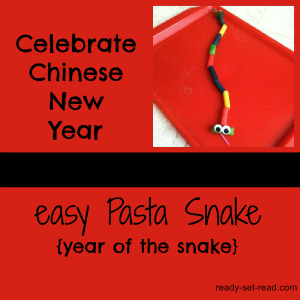 I am going to share him on my Pinterest Chinese New Year board and on the Read.Explore.Learn. Facebook page.